Amazon will donate 0.5% of the price of your eligible AmazonSmile purchases to Friends Of The Elko County Library whenever you shop on AmazonSmile. Simply follow the link below, sign in to Amazon, and choose "Friends of the Elko County Library" as your charitable organization. AmazonSmile is the same Amazon you know. 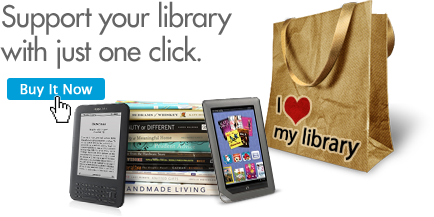 Same products, same prices, same service, so support your local library by starting your shopping at smile.amazon.com today. A portion of your purchase from the OverDrive WIN Affiliate Retailers using the “Buy it Now” link from your library’s website is credited back to this library. The funds your library earns from this program will be a credit for the library to add digital content to its virtual branch. The titles and materials the library selects are at the library's discretion. When you use the “Buy It Now” links below, any eBook, digital audiobook, and other items purchased from OverDrive WIN Affiliated Retailers will provide this library with a credit from your purchase.